WASHINGTON (CNS) — Maybe it was the request by the Pentagon for 20,000 mattresses as military bases become, at least partly, shelters for detained border crossers. Maybe it was the federal government report that 2,352 children had been separated from 2,206 parents at the U.S.-Mexico border between May 5 and June 9. Maybe it was the now-famous audio recording of children crying after being separated from their parents. Or maybe it was the pictures of kids in cages. 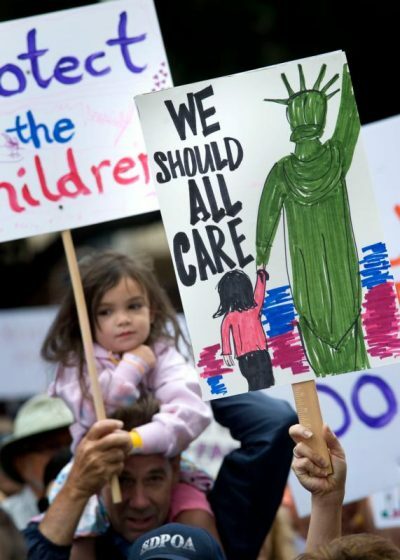 Whatever the reason, hundreds of American adults have called the Washington headquarters of the U.S. Conference of Catholic Bishops seeking to provide foster care for the separated children. At first report June 20, 300 calls had come in. And the calls keep coming. “We’re triaging the calls,” said Katie Kuennen, associate director for children’s services for the USCCB’s Migration and Refugee Services office. The one hitch: Most of those who have called are not licensed or certified to be foster parents. That’s a process that varies from state to state, according to Kuennen. While most states can train and certify parents for foster care in two or three months, some states can take a lot longer. Further, while many Catholic Charities USA affiliate agencies are set up to match foster families with children, not all are. MRS, Kuennen said, also partners with Bethany Christian Services in some areas of the country. Agencies wishing to add foster care to their portfolio of services can typically gain state licensing in a month or two, she added. So what happens when the calls come in? “We’re able to direct them to the nearest ORR foster care program that we have available,” Kuennen told Catholic News Service June 22. ORR is the acronym for the federal Office of Refugee Resettlement. Even though President Donald Trump signed an executive order June 20 that essentially reversed that part of the administration’s “zero tolerance” policy that separated kids from their parents, it was silent on the fate of those 2,352 kids already torn from their folks, plus whatever additional children were separated from their parents after June 9. Moreover, a policy enacted in 1997 sets a 20-day limit for detained children to be detained alongside their parents. A Trump administration request to exceed that limit is before a federal judge in California. However, “our department is currently responding to a funding opportunity announcement from ORR. I’m sure others (agencies) are as well. We are actively seeking to increase our transitional foster care and our long-term foster care,” she added. It could be coincidence that the ORR money is being freed up at this time, or it could be consequence. Although the money won’t be officially freed up until the start of the new federal fiscal year Oct. 1, Kuennen said there is precedent for ORR to retroactively reimburse groups it has funded for expenses incurred if the group can show the money was spent on the specific grant plan.